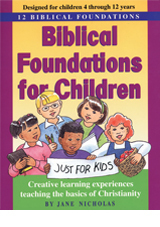 Creative learning experiences for ages 4-12, patterned after Larry Kreider’s Biblical Foundation Series, with memorable truths in each lesson to take kids on the first steps in their Christian walk by teaching them how to build solid, foundations in their young lives. Step by step Bible basics learned systematically in 48 lessons. Active learning with a fun craft or activity with each 40-60 minute lesson. All inclusive curriculum. Handouts and craft ideas are photocopiable. Lessons for home cell groups, children’s church, family devotions, Sunday School. The Biblical Foundation Series for adults is available in English, Spanish and French!